Sometimes it's the little tweaks that can yield the biggest results. Here's an example. Disney's Epcot park hosts an international food and wine festival each year. Guests make their way through the different international restaurants and booths, tasting foods from the countries represented. In 2010, they began giving guests complimentary festival passports. The passport has a list of menu items and serves as a map that helps guests locate the different food and beverage offerings in the park. As an added feature, each restaurant/booth had a customized ink stamp for guests to collect when visiting their "country." Cast Members would physically stamp each guests' passport by using an ink pad. This was a great idea and guest loved it. But as more and more guests began to participate, the lines for getting your passport stamped grew. Cast Members noticed that it was negatively affecting guests' experience as they had to wait in long lines to get their passport stamped. This also caused wait times to order food to increase. Cast Members began to work together to come up with a tweak that could make the experience a better one for guests. They came up with the idea of changing the stamps to stickers. Now inside the passports, you will find stickers already provided that you can tear out and stick on the page of each corresponding country as you visit there. This little tweak has yielded big results. Not only has it dramatically cut down people's wait time, it has also enabled Cast Members to better focus on providing great customer service to guests. So what made this little tweak possible? First - team members, who were serving on the front lines, were empowered to offer suggestions for improving the process. This is a very important factor, if you want to improve your ministry. Volunteers must be empowered and encouraged to offer feedback and make suggestions for improving the ministry. They are the ones who are serving face-to-face with kids and families, implementing lessons, interacting with guests, leading small groups, greeting parents, checking people in, preparing crafts, etc. They are the best people to offer insight and suggestions for tweaks and changes that can make the ministry better. Second - leadership listened. The Cast Members were willing to offer suggestions because they knew it would be heard and carefully considered by leadership. This same atmosphere must exist in your ministry if you want to find tweaks that can make the ministry better. Volunteers must know that their insight and suggestions will be gladly received and listened to...really listened to. Third - changes were made. As mentioned in the beginning of this article, the company didn't resist the suggestions. They gladly received it, thought it through and then acted upon it. A ministry that wants to become better must be willing to make the small changes that are necessary at times. You must create a culture that embraces change rather than resisting it. You would be surprised how many churches are stuck simply because they are not willing to make small changes that could yield big results if embraced. Does our ministry look for ways to improve our programs, processes, experiences, etc.? Are we intentional about getting feedback from our volunteers? Rather than waiting for them to give it, do we take the initiative and seek it out? Do we listen...really listen to suggestions? Do we debrief after events and talk about tweaks we can make to improve it the next time? Are we cultivating a culture that embraces change? When we make tweaks, do we let our team members know and celebrate the improvement with them? 1. Gather a small team and carefully inspect your facilities when no one is around. Make a note of tweaks that can be made to improve it. Write down at least 3 things. 2. Hold a focus group with a group of 8-10 parents. Ask them how you can improve the ministry? You can get more information about how to do this in this post. 3. Hold a focus group with a group of 5-6 kids in your ministry. Ask them how you can improve the ministry. You can get more information about how to do this in this post. 4. Watch the ministry during service or program times. Watch the traffic flow in the hallways. Watch the teaching. Watch the check-in and check-out process. Watch how the kids respond during class. Watch as people enter and exit the building. Watch how effective the service elements are. 5. Ask these 3 questions after each weekend, event and program. 6. Bring in a secret shopper. Sometimes it takes outside eyes to see the tweaks that are needed because every ministry has blind spots. I can help you with this. Here's more information. If you started being very intentional about looking for, finding and making small tweaks to your ministry...even if it was just one tweak a week...a year from now your ministry would be 52 times better. 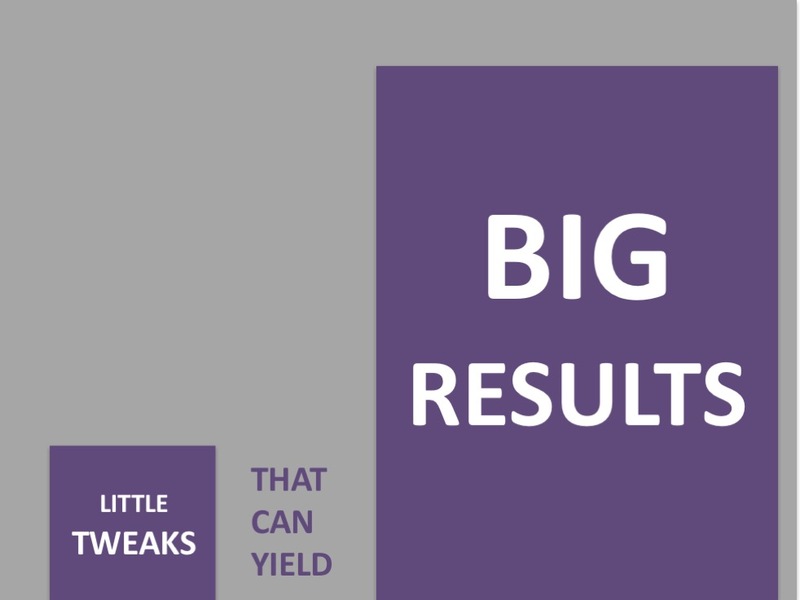 Take it from Disney...little tweaks can yield big results.